JET JLH series lever hoists combine a true industrial design with highly refined quality culminating in the last lever hoist you may ever need to purchase. The attention to detail in the design of this series is second to none. The drop forged, carbon steel hooks are quenched and tempered to increase strength and will slowly stretch to indicate an overload situation. Cast steel safety latches, attached with Allen head screws and lock nuts, outclass the industry standard of stamped safety latches. The induction hardened, 100 grade load chain provides 20% more strength than the common 80 grade load chain found on inferior lever hoists. While the caged needle bearing supported load sheave provides efficient and smooth operation. The investment cast anchor plate, and all other internal parts are fully heat treated and quenched for added strength and reliability. All the internal parts are Zinc coated for additional corrosion protection. The triple spur gear drive train features alloy steel gears that have been heated treated, quenched and then case hardened for a lifetime of service. Finally, the patented fused brake disc design means little to no maintenance is required to keep these hoists operational. Every JLH lever hoist is factory tested and comes with a signed test certificate from the factory. All JLH lever hoists comply with ANSI/ASME B30.21 and HST-3 standards. Don't settle for anything less. Pounds of Pull to Lift to Capacity: 83.7 lbs. 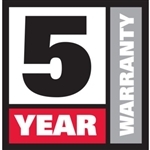 This JET product carries a limited five-year warranty.